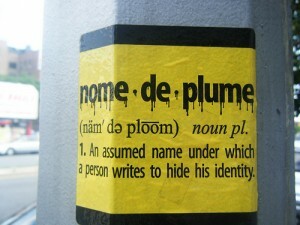 I myself use a pen name, a derivative of my real name, for my online dealings. It just seems natural. Name are just labels anyway, easily changed to meet our needs. I’ve never used a pen name, but I understand why people use them, and you never know, I may have to use one at some point! Owen is my actual middle name (and what I prefer being called), and Garth is a nickname. I just don’t like the idea of what’s on my driver’s license and birth certificate being splayed all over the internet, but maybe I’m just paranoid. No, that’s fair enough, many writers use their middle name or just their initials. I’ve thought about it as well, because there is another journalist with my name, and I may have to write under a different name if my career takes off. If.